Retired astronaut Mark Kelly, who rocketed to the national spotlight when his Congresswoman wife Gabrielle Giffords was shot in a failed assassination attempt, announced Tuesday he's running to finish John McCain's last term in the U.S. 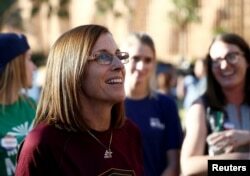 FILE - Then-Republican U.S. Senate candidate Rep. Martha McSally, center, talks with people waiting in line at the ASU Palo Verde West polling station during the U.S. midterm elections in Tempe, Arizona, U.S. Nov. 6, 2018. FILE - Former U.S. Rep. Gabrielle Giffords, who survived a gunshot to the head in 2011 during a mass shooting in Tucson, Ariz., sits with her husband, retired astronaut Mark Kelly, at a Senate panel hearing on gun violence, on Capitol Hill in Washington.